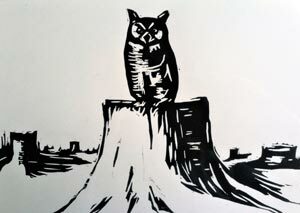 A SPECIAL PUBLICATION FROM NESTUCCA SPIT PRESS HAND-SET AND PRINTED BY TRAVIS CHAMP AT MANZANITA PEOPLE’S PRINT SHOP. My father, Karl Love, taught masterfully for 35 years in public and private schools in Oregon and Brazil. He retired from the classroom in 1991 but it was my good fortune to teach alongside Dad at Oregon City High School during his last job. I was in my second year of teaching and felt unsure of my future in the profession. I had neither a coherent teaching philosophy nor a defined idealism. One day, I overheard Dad discussing an indifferent student with a struggling colleague. “Don’t prop up mush,” he advised. I wrote this succinct phrase down and began compiling all of Dad’s maxims on teaching because they taught me how to teach with efficiency, integrity and passion. Over the years, I kept adding to my list after each new maxim emerged from one of our many conversations on the art of teaching. 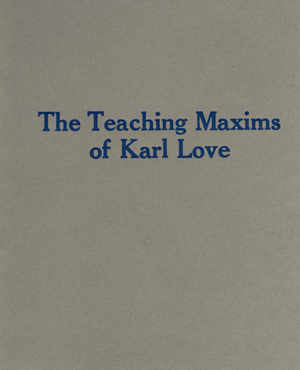 To me, these maxims provided a concise and crystallizing model for dynamic and timeless teaching for any grade level. They are organic. They are in no way academic. They don’t belong to ideologues or consultants. They are utterly practical. They separate the strong teachers from the weak and my father was the most effortlessly strong teacher I have ever observed. I publish my father’s teaching maxims not as a panacea for improving education. Rather, I hope they assist and inspire self reflection in teachers, something teachers should practice daily unless they want to stagnate and pine for the “old better days,” which of course never existed.